Google use software known as “web crawlers” to discover publicly available webpages. The most well-known crawler is called “Googlebot.” Crawlers look at webpages and follow links on those pages, much like you would if you were browsing content on the web. They go from link to link and bring data about those webpages back to Google’s servers.Today Google’s algorithms rely on more than 200 unique signals or “clues” that make it possible to guess what you might really be looking for. But is it perfect? The answer is Big NO.  Search Engine Land reports tell that the search engine giant resolves 5.5 billion user queries every day and around 2 trillion queries per year. When there is such a large volume of queries to process, it is close to impossible for Google to give accurate results every time. However, an Indian user has got a complaint about Google search and it seems she is right. 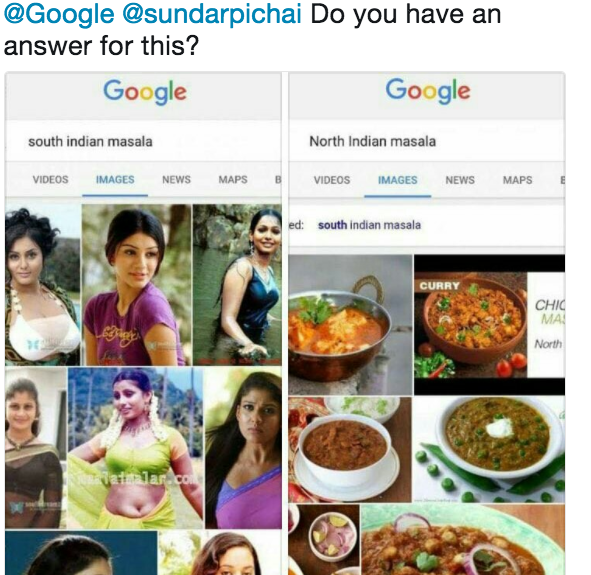 While it has been earlier discussed that Google results are sometimes far from perfect, but this user found the results vulgar when she tried searching for “South Indian Masala”. 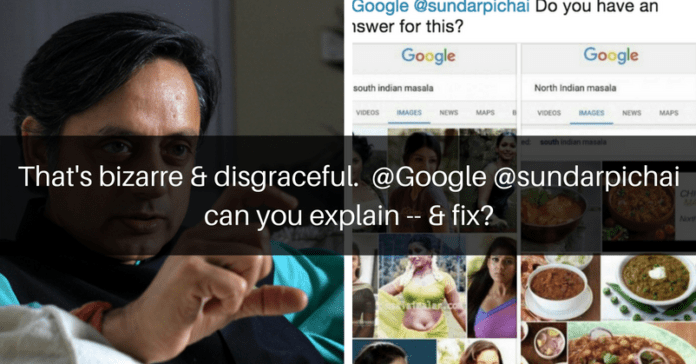 When she put this query in Google Images, it generated a list of obnoxious photos of South Indian actresses. She then tried to change the query and searched “North Indian Masala” and results were perfect. She then posted the snapshot of results on Twitter and requested Google CEO Sundar Pichai to look into the matter. @Google @sundarpichai Do you have an answer for this? That’s bizarre & disgraceful. @Google @sundarpichai can you explain — & fix? That's machine learning for you! The society has trained Googles algorithms like that. Dont think its their fault! So that means people have actually created the webpages for these keywords with these obnoxious pictures . Google can't do much. Don’t you think Google should do something about this? What’s your opinion on this? Previous articleFunny Wax Statue of Ranveer’s in Museum Of Paris Launched. See How Twitter Cracked Up!